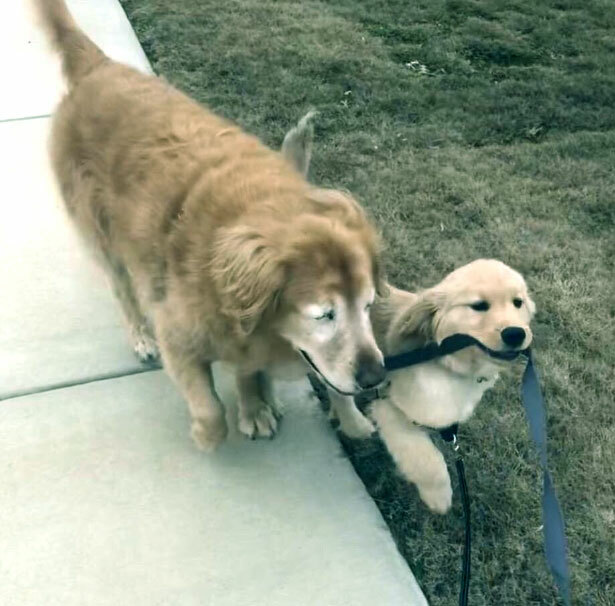 Blind Retriever & Guide Dog Puppy! Charlie and Maverick, Charlie is almost 11 years old and Maverick is 4 months old. Charlie had glaucoma which led to his double enucleation (both eyes removed). Now, Maverick is here to help Charlie around and Charlie is trying to teach Maverick manners. 藍 definitely a work in progress. In 2016, Charlie had to have his left eye removed after the dog contracted glaucoma. A year later, Charlie began to go blind in his right eye so Stipe decided it had to be removed as well. 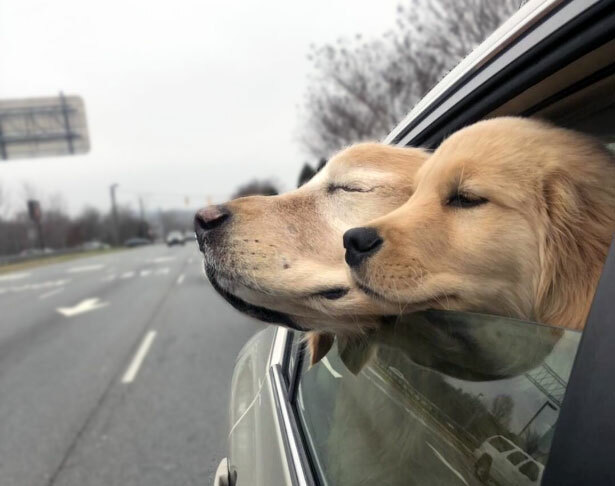 Charlie and Maverick enjoying the car rideFor us it was a no-brainer, empty our retirement plan to care for this dog because he makes us happy,’ Chelsea Stipe said. When Chelsea became pregnant, she figured getting a puppy would be a great way to make sure her child had a dog to grow up with. The family got Maverick on New Years Day 2019. At first, Charlie was not thrilled to have the new puppy around, but he eventually got comfortable with his new friend and Maverick quickly noticed that his old pal was a little different. ‘When they would play, Maverick would realize that Charlie would lose the toy sometimes, so (Maverick) would pick it up and put it back in front of him to re-engage playtime,’ Chelsea said. The pair even learned to walk side-by-side to support each other. ‘They almost turn into little sled dogs where they’ll walk together,’ Chelsea said. The heartwarming tale of Charlie and Maverick was widely shared after WeRateDogs tweeted photos of the pair after Chelsea submitted the dogs’ story and pictures. Less than an hour after posting, WeRateDogs reached out to Chelsea and told her she should make an account for the pair. She agreed and the account has taken off, gaining more than 20,000 followers in its first day. ‘Everything has just been so positive and loving and I’ve even had people reaching out about their dogs who had glaucoma,’ She said.